Almost all mountaineers take the help of sherpas while summiting the Mt Everest. But the duo decided to risk it on their own after one of their sherpas received a head injury while climbing at camp three and had to be rescued by helicopter. Both the climbers did not use supplementary oxygen till camp four. Itanagar: Mountaineers Kishon Tekseng and Taka Tamut from Arunachal Pradesh have acheived the rare feat of scaling Mt Everest without any sherpas, a senior state government official said yesterday. Mr Tekseng, from Yingkiong in Upper Siang district and Mr Tamut, who hails from Jomlo Mongku in Siang district scaled the world's highest peak on May 24, ten days after Muri Linggi of Roing who became the seventh Arunachalee to achieve the feat, state sports and youth affairs joint director Ramesh Lingi said. 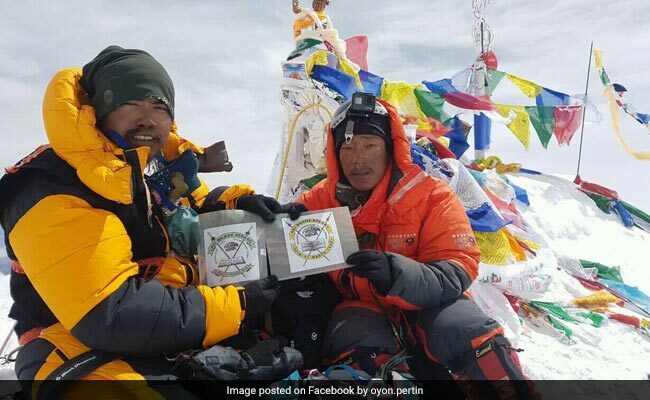 Mr Tekseng and Mr Tamut reached the peak at 9 am of May 24 and unfurled the national tricolor atop it after a gruelling 13-hour non-stop climb from camp four (south column) known as Death Zone without any support staff, Mr Lingi said. "Both the climbers have inked a new record with this heroic climbing of the Mt Everest. They did not use supplementary oxygen till camp four (26000ft)," he said. Almost all mountaineers take the help of sherpas while summiting the Mt Everest. But the duo decided to risk it on their own after one of their sherpas received a head injury when rocks rolled down while climbing at camp three and had to be rescued by helicopter. The sherpa was airlifted to Kathmandu in a critical condition and underwent head surgery. The two climbers reached camp four with the help of one Sherpa, but the man fell ill due to high altitude sickness which prevented him to proceed further. The two then set out on the last leg on their own. They had had been trained in mountaineering in different national institutes over the past four years and had scaled Mt Stok Kangri (20,187 ft) of Ladakh as pre-Everest expedition. The other Arunachalee climbers who scaled the highest peak include Tapi Mra (2009), Tine Mena (2011), Anshu Jamsenpa (2011), Nima Lama (2011), Kalden Paljor (2011) and Tame Bagang (2013).